﻿ Formula 1 Prize Money 2019 - How much do F1 drivers and teams earn? The Formula 1 prize money 2019? The 2019 FIA Formula One World Championship is one of the biggest motor racing championships in the world. The F1 stands for Formula One cars and the world championship is the 72nd event of the Formula One World Championship. It is validated by the governing body of international motorsport, the Fédération Internationale de l’Automobile (FIA), as the highest class of competition for open-wheel racing cars. Drivers and teams are competing in twenty-one Grands Prix for the World Drivers’ and World Constructors’ championship titles. Here we take a look at the Formula 1 Prize Money 2019. So how much prize money is there in the Constructors Championship? Well, Ferrari will be earning the largest amount of the Formula 1 revenue share. F1 follows a strange revenue share model and we take an in-depth look at how much money there is. F1’s 2019 revenues are estimated at $1.38bn which is shared among teams and other shareholders. That is a huge amount of money! It is one of the highest-earning sports competitions in the world. There is huge money in the Formula 1 and some estimates suggest it generates up to a billion dollars of revenue. So where does it go? The CVC (parent company of Formula 1 group) is responsible for distributing the prize money. Revenue from one race can range between $100 million to $140 million. Meanwhile, Formula 1 revenue is growing every year. In fact, in 2014 total revenue was around $1.8 billion. Formula 1 prize money 2019: How does Formula 1 distribute their prize money? The F1 distribute total profit to all the teams. However, drivers don’t receive any prize money because Formula 1 drivers are paid salaries by the teams they drive for. So is the money distributed evenly throughout the teams? Well no, is the simple answer. 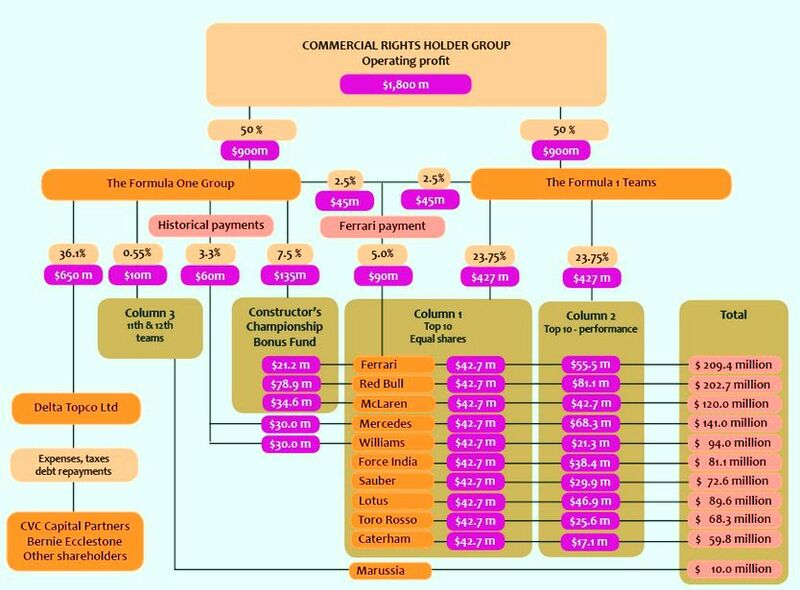 The Formula 1 revenue is divided into two categories (50% each) and one half goes to Formula 1 teams (prize money fund) and the other half goes to formula 1 group and shareholders. The prize money fund: F1 divide the money into several parts. (Column 1 payment = F1 divide 23.7% equally for top 10 teams while they divide Column 2 payment 23.7% for teams according to how they finish in the constructor championship). 2.5% goes to Ferrari who have a special contract with Formula one. Top ten teams receive the column one and column two payments. F1 share column one payments equally among top 10 teams in last three years. F1 share column two payments through the top 10 teams depending on how they finish in the current constructors championship. Teams who finish outside the top ten get a column three payment which is around $10 million just for being part of Formula 1. All 11 teams earn transportation costs. So how much do F1 drivers actually earn? Formula 1 Prize money 2019? Well that’s hard because the teams decide on how much they will pay their drivers. Usually the money they will give more to the driver who has won the most- through bonuses to their salaries etc. But the highest earning drivers such as Sebastian Vettel earns around $50 million a year! Below we have the 2016 Formula 1 Prize money table. Mercedez won the constructors championship title that time and earned around $148.5 million. Meanwhile Ferrari earns a massive $208 million despite finishing second due largely in part to historic payments. Related2018 FIA Formula One World ChampionshipConstructors Championship?Formula 1 money distribution among teams and the stake holdersFormula 1 Prize Money 2018Formula OneGreatest Formula 1 driversHow does Formula 1 distribute their prize money? Is lewis hamilton have a weekly allounce?